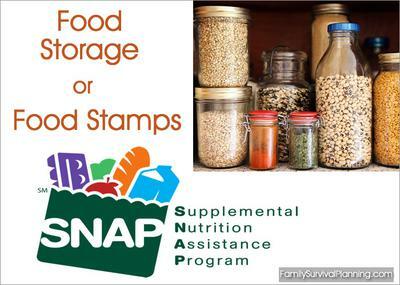 Food Stamps or Food Storage? There are surely people that are spending their money wisely and don’t have extra money leftover, but the majority of Americans could change their spending habits and invest the savings into some extra food storage each month. The Department of Labor conducted a survey and 43% of the money spent by a family on food went to “food away from home”. Cutting back on eating out or other frills could go a long way towards building your food storage and emergency preparedness plans. Gardens are a fantastic way to fill up your pantry for a lot less. Even if you have limited space, or you need to grow indoors, it's worth it. Gardens will not only make you more self-reliant, but they will also help you eat a more healthy diet. Square Foot Gardening is a great space saving option for some people. Check the internet for local food co-ops. Many times you can save big on fruits, veggies, and even meat through a co-op. You get way more for your money this way. With a little extra effort, you can find amazing deals on food with coupons. Check your local store ads and the internet for fantastic websites that help you find the very best deals anywhere. Of course, you will need to be focused on buying needs - not wants. Buy a little extra each week. Instead of two cans of soup, buy three. Instead of one bag of pinto beans, buy two. You get the idea. Using this method will work - it all adds up to a full pantry eventually. Many times companies will give bulk discounts to groups of people who are willing to pool their money together to buy in bulk. This is a win, win for both you and your family and friends. We all have had to learn many tough lessons from time to time. If we continue to rely on the basic principles of self-reliance that our parents and grandparents taught us, we will be able to weather the storms of life much better. Comments for Food Stamps or Food Storage? Also, consider working at your local farm or food bank in exchange for food. There is tons of food available and going to waste. Return to Survival Tips Blog.